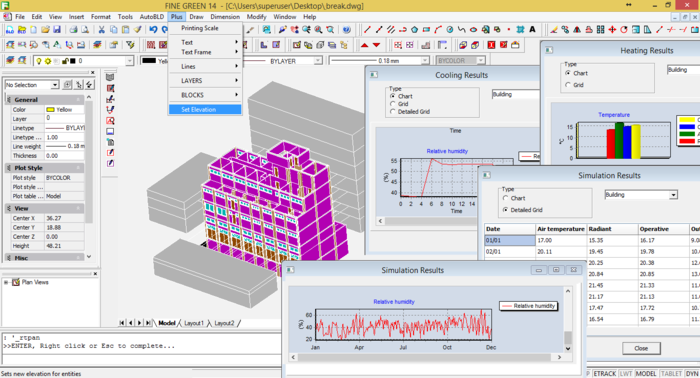 FineGREEN is a BIM simulation environment that combines the Building Information Modelling power and user friendliness of the 3D Building interface, with the reliability and accuracy of the EnergyPlus® calculation engine. FineGREEN embeds the latest version of EnergyPlus® and allows the easy determination of the best energy-efficient building design solutions from the initial architectural concept through the HVAC design and the entire project completion. FineGREEN is the only BIM Powered Software that provides the Energy Assessor with a true 2D-3D drawing environment that is using DWG as its native file format. The assessor can import IFC files of the building 3D model produced by the building designer directly into the FineGREEN. FineGREEN includes also all the CAD features of 4MCAD, a fully functional 2D/3D CAD software which is also known as the smart alternative to AutoCAD. 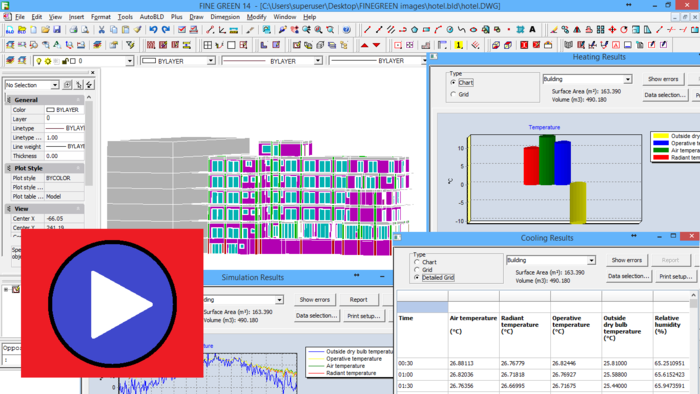 FineGREEN generates the input data for EnergyPlus regarding both, a) the building envelope (geometry parameters of the building elements, building location and orientation, shading model automatically updated by the neighbouring buildings and other outdoor objects), and b) all the necessary complementary data (climate data, systems' parameters regarding HVAC and lighting, zone parameters such as the density of occupants, operating schedules and behavioural pattern). FineGREEN's high efficiency is due to its Smart 3D BIM building model, being composed by intelligent building entities/objects with their own specific properties (i.e. U-Values, types following Ashrae etc). On this 3D BIM model, the user can easily define intelligent building properties (i.e. visual definition of building zones, non-conditioned spaces, shading from adjacent buildings, etc). Its easy-to-use (Autocad®-like) BIM interface is full DWG compatible and at the same time full IFC compatible to ensure the close collaboration with any other BIM application, such as Revit, Archicad, Allplan, IDEA etc. FineGREEN enables the designer to study effectively alternative design scenarios in order to reach the optimal solutions for any type of a new construction, as well as to identify the most interesting retrofit design alternatives. FineGREEN incorporates Energyplus within a seamlessly integrated BIM environment. It uses energy performance and consumption indicators, precisely calculated for alternative design scenarios and permits the real time extraction of the building annual energy consumption along with costs and other outcomes. 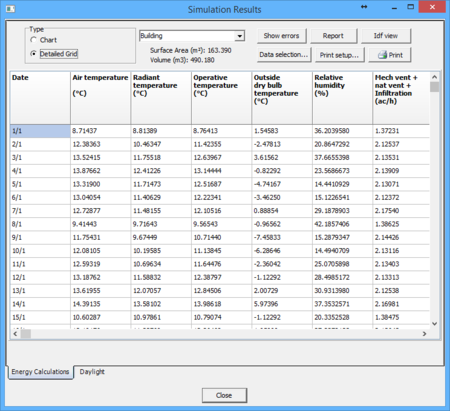 Simulation results are organized in detailed output tables, charts and graphical representation forms, to make easy the comparative evaluation of the alternatives. FineGREEN contains rich libraries open to the user, including building components, construction assemblies and materials, weather files and climate data, HVAC and lighting equipment, as well as ready to use templates with structure and system profiles, operating schedules etc. FineGREEN collaborates seamlessly with FineMEP and FineHVAC to support the detailed sizing of the HVAC systems, by providing detailed calculations according to the specific standard/norm selected, plus complete drawings with construction details.